You may already ride but are curious about club riding. We will show you how to ride in a group setting. For the person who is new to riding, consider joining us on one of the “Meet PWTC: BITS” or “Back in the Saddle Again” rides. These rides are offered twice a month throughout the year by ride leader extraordinaire, Ann Morrow. You do not need to become a member before trying out any of our rides. Just show up at the start location 10 minutes ahead of time! Learn about group cycling and explore by bike. Build your skills and test your mettle. Mostly flat and easy. Find out why bicycling is such a popular sport – You can do it! See the ride schedule for MEET PWTC rides. 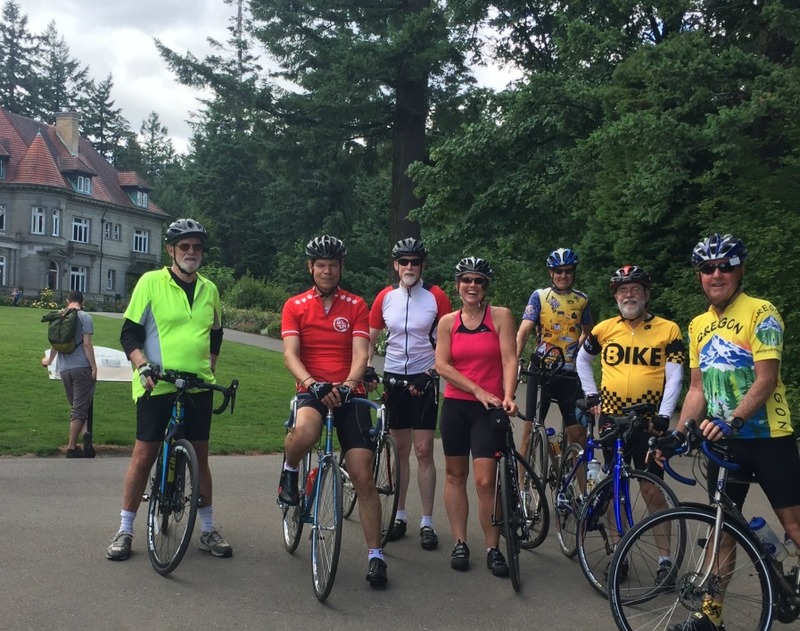 Portland Wheelmen Touring Club (PWTC) offers a series of rides called Welcome to PWTC from Spring to Fall. You need not be a member to participate. These rides are especially for the newer or less experienced rider but are probably too ambitious for a novice rider. The expectation is that the rider can pedal along at 12 to 15 mph on the flats and complete a 30-mile ride. These are group rides which means the group of riders generally stays together throughout the ride. The ride leader will guide the group and offer riding suggestions as needed. Theses rides provide a safe, friendly opportunity for newer riders to get out and ride with other cyclists. More information may be obtained by calling the ride leader listed on the ride description. Click HERE to download the 2018 Welcome Ride schedule. These rides are another great option if, as a new rider to the Club, you are concerned about keeping up. These are group rides led by Chuck Dorr (Slowpoke Chuck). They are more social and keep the pace at around 10-12 mph. Great for veteran riders that want to go a slower pace as well. If you ride an electric assist bike, we are positively CHARGED UP to have you join us! Please see this page for a description of how are rides are rated and some helpful tips on how to be prepared to ride. Please familiarize yourself with our safety policy. Bike safety is one of the Club’s main priorities. Want to add a quick and easy ride calendar icon to your smartphone? Find the directions HERE!